The top on this Gibson J-200 has bellied a bit, so much so that the lacquer on the top has started to crack. 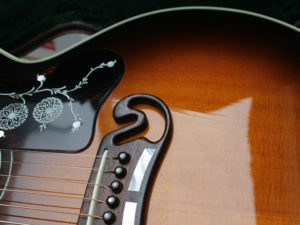 Consequently, I had trouble getting a low action and thought the guitar might be suitable for the JLD Bridge system, which can correct bowed tops. Installing the JLD system was straightforward enough. 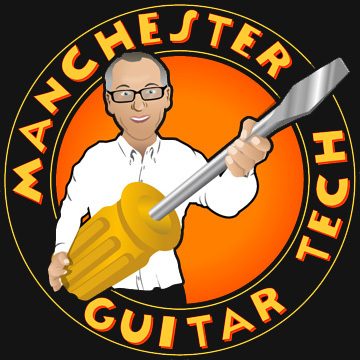 I removed the endpin jack to be able to align the bridge system inside the guitar, with the rod contacting just below the endpin jack. You should be able to see the body of the Bridge System in the lower photo. The JLD bridge system won’t fix all guitars but in this case, the installation was a success and not only was the string height reduced but the guitar sounds better with an improved, tighter bass. I’m hoping that as the top responds to the tension of the bridge system, the action will come down even more in the coming weeks. I saw this in Phil Balmers book recently and am wondering about having a go… I’d like to get to being able to doing these kind of repairs myself. This is the one that uses a screw through the bridge. The type with brass pins can suffer from low break angles over the saddle if the saddle is low. I don’t know of a UK distributor, I buy them, like a lot of things(! ), from Stewart Macdonald. And a brilliant job you’ve done too! Thanks Steve! Got my JLD Bridge System from StewMac last week and fitted it to my Epi FR300 yesterday, a piece of cake. The most noticeable differences are that it seems quieter from a players perspective but louder from the listeners and that its intonation has been restored as the bridge/saddle is now back where it should be. I do worry that I’ve got the tension right as it had quite a serious belly bow which I’ve managed to all but remove but I’m sure all will be well in the end, any advice you might have regarding this point would be very well received. I’d recommend that you take out the bellying in stages if it is really that bad so that you don’t overstress anything. Initially perhaps 50-60% and gradually take out more over many months. It took a long time to get like that so it needs to go back slowly as well! 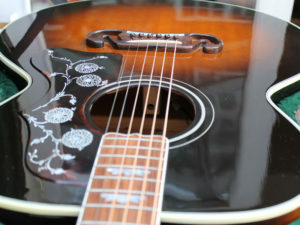 I have an old Antoria “j200” the infamous wonderwall guitar. I’m wondering if a bridge doctor would fix the belly it has developed but the pegs are very far back on the bridge with no room behind. Does the JLD screw have to go behind the pegs for it to work?